Kristen believed her parents were truly happy, and she wanted a marriage like theirs. She really didn't know anything about their relationship until she was leaving for college. That was when they dropped a heartbreaking bombshell on her. They stayed together only to make her happy. Now that she thinks she is the reason for their unhappiness, can she trust love? Her new college roommate, Alexia, changes her mind about love. Seeing how fast Alexia falls for her dreamy guy, Phillip, and how fast that dreamy guy falls for Alexia, Kristen realizes that maybe love could happen in her life! Now Kristen has to change her ways and open her heart up for love. Can she do that after watching her parents live a lie for so many years? Hoping she can find her true love and not get hurt, Kristen thinks she can find him out there somewhere, but where? One tragic moment happens to her friend, and it makes her realize that life could end in a blink of an eye. Kristen makes a life decision that affects her and her friends. Can she go through with it? This is the greatest gift she can give to her best friend, Alexia. Nine months of her life is a long time to give up for a friend. Will this sacrifice be truly appreciated, and will Alexia be able to take care of her precious gift? Yes! Loved the narrator and how she brought this story alive!! What other book might you compare The Life Gift to and why? This is a unique story and the second in the series. What about Daniele Passantino’s performance did you like? She did an incredible job. Especially in one chapter that had a heartbreaking scene. This book has it all. I laughed and cried during several parts of this story. Loved it and will be buying for my friends. The Life Gift is the second installment in the Last Heartbeat YA/NA clean romance series. Book one was Alexia and Philip's story. This book picks up where the last one finished, but this time it is Kirsten's story. It is told all from Kirsten's perspective and covers a five year period. The life gift continues raising awareness of the ongoing issues that organ transplant recipients face and also raises awareness of miscarriage and surrogacy. Themes such as marriage, divorce and good communication are explored as well. I was a little frustrated with Kirsten for being so surprised to fall pregnant when she wasn't planning to. If you don't think you are ready to be a mother, then use contraception! "Practicing" to get pregnant without contraception generally will get you pregnant. Even though she was very well spoken (always said I am rather than I'm) she still came across as quite immature. But then I have 20 years more life experience than her, so I guess i was probably the same at her age! If you're looking for a quick read full of sweet perfect characters and a happily ever after then this is your book. It would be best to read The Last Heatbeat first, but you could read this as a stand alone as it gives enough of the background information to understand what is going on. I listened to the audiobook edition which I received free in exchange for an honest review. The narrator spoke clearly and at a good pace. This was a terrific follow-up to the book "Last Heartbeat." It picks up with Alexia's best friend Kristen. She wants to find the love of her life the way Alexia and Phillip did. She and Jason settle down and have a baby girl named Shawna. Kristen notices how much Alexia wants a baby but she can't have one because of her heart transplant and Kristen decides to do something amazing for her friend Alexia. This is a testament of true love and friendship. I love the way Jason calls Kristen 'cupcake'. What I especially like about this story as well as "Last Heartbeat" is that they're good, clean stories with a bit of a life lesson in decision-making. In my opinion, you can't go wrong here. This story is cute and smart and perfect for any audience and especially young adult. I applaud T. R. Lykins for writing these stories and look forward to more. I really like Daniele Passantino's narration of this audiobook. I think she did an excellent job portraying Alexia's friend Kristen. She also did a nice job with the other character's voices. She was perfect and I'm happy to find another voice actor I like. Great work! Audiobook gifted from the author for review. Thank you! I love it.. love how the voice changed so you could know who was talking an could follow along a lot easier. This book is the second in a series.I wasn't fond of #1 and less so of this one.It's a way too clean love story.Very shmaltzy and predictable.The narrator,Danielle Passantino, was not able to make voices aside from the main character believable.Kristen is married to Jacob.She gives the gift of a child to her best friend from college who has a donor heart.Her husband has a donor spleen.We learned about this in bk 1.Kristen goes on to have a few more children.They all live near the beach.life is good.I was given this book for an honest review. 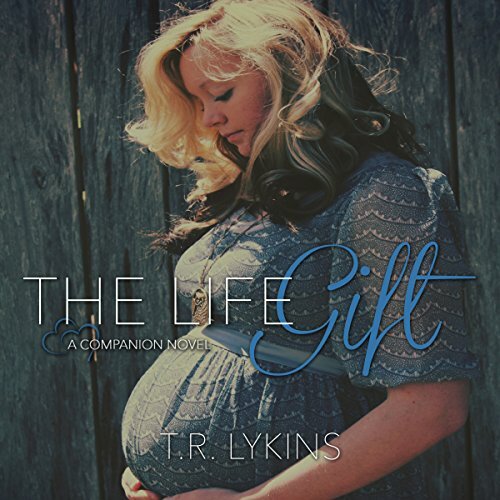 This book is so endearing and poignant...things T. R. Lykins are known for. If you like romance, she's the one to start reading.